There are lay readers and chalice bearers at St. Andrew's, who rotate serving at the Sunday services. There is a core of lectors who read very regularly, with others who read occasionally. Some members of our parish have completed the training to become Lay Eucharistic Ministers and some have become licensed to administer the Eucharist to shut-ins and the hospitalized. 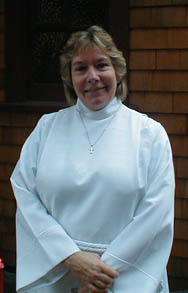 Rochelle Kelly coordinates the Lay Ministry. The Pastoral Care Comittee supports parishioners who are sick, shut in, or need a helping hand or a listening ear. If you're willing to help, or know someone needing a call or visit, contact Ted Parske. Or to help sign up on the sheet in the parish hall.